It is the third longest-running ‘how-to’ best seller of all time.Translated into 51 languages and available in 109 countries, the Rich Dad series has sold over 27 million copies worldwide and has dominated best sellers lists across Asia, Australia, South America, Mexico and Europe.The book shows you few lessons from “rich dad” which will teach you a different attitude to money and life. Learn to think like a rich dad and let your money work for you! Let the rich dad to show you the way. I just looked at my bookshelf and saw that I have a copy of this book too. It’s a wonderful book but one that I have read a long time ago and I don’t really remember the contents. I think it’s time to re-read this book. Thanks for sharing. Hi Vonnie, I highly recommend you to read it again then 🙂 It’s worth it! 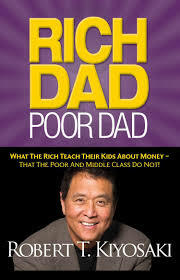 I absolutely love Robert Kiyosaki. I have the majority of his books. I know the basis of all his books is about expanding your financial intelligence but he does a great job in this one with starting at the basics. He has led me to start my own businesses and purchase real estate and it has been great. Our minds are a powerful thing and we really can do whatever we put our minds to. I heard about this book about a year ago and it has totally changed my perspective on money and life as a whole. I grew up knowing the traditional path of life-go to school, get a job, work for 40 years, retire. But when I read this book, I realised that these traditional thought patterns that I had were utter non sense.I finished the book in 3 days! It really is a must-read for those who want to start the journey to financial freedom and independence.